Helene Knott is a prolific designer of applique quilts. One such set of blocks is her "Garden Patch Cats". They are of cats depicted as various vegetables and are simply terminally adorable. As the "Garden Patch Cats" is probably going to be about 35 patterns, you can pick and choose which ones you want to put in your own quilt. I don't NEED another quilt project right now. At the current time, I'm working on my List of 17 Tops that need to be quilted, so I am NOT NOT NOT piecing any new tops! But I still need something to do in the evenings when I am watching TV. So when I saw Podcats, I knew it was something that I could do that wouldn't result in another quilt. I could make it as a throw pillow instead! Rather than use predictable, normal colors for the cats' faces, I opted to make them in red, purple and blue. No, don't be aghast .. there's a reason for this! You see, when our girls were little, I "color coded" them. Just about everything I bought them was in shades of those colors so that even before they could read, they *knew* which items belonged to them simply due to the color. This was a very fast project for me. Even faster than I had anticipated. I started it on February 12th, after I returned from my Quilting Retreat. I got the applique done in three days, took a break, then finished it up yesterday (February 23rd). I'm surprised but pleased that this project is done ... but now I need another project for the evenings! That picture is just a teaser! 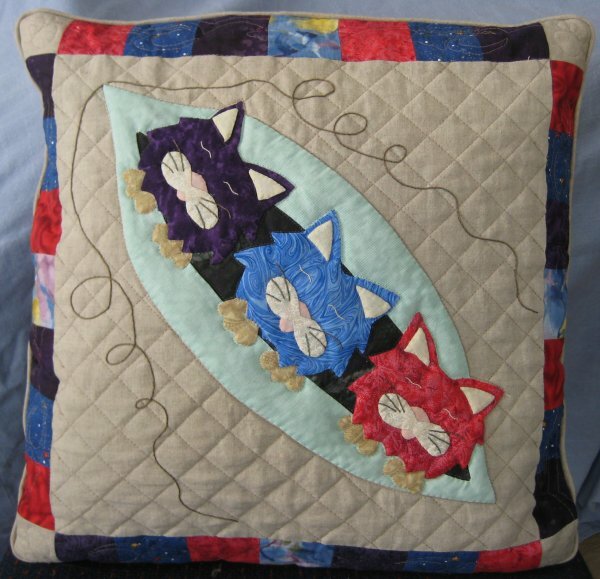 For all the gory details, links and more pictures, please visit my web page for the Podcats throw pillow. 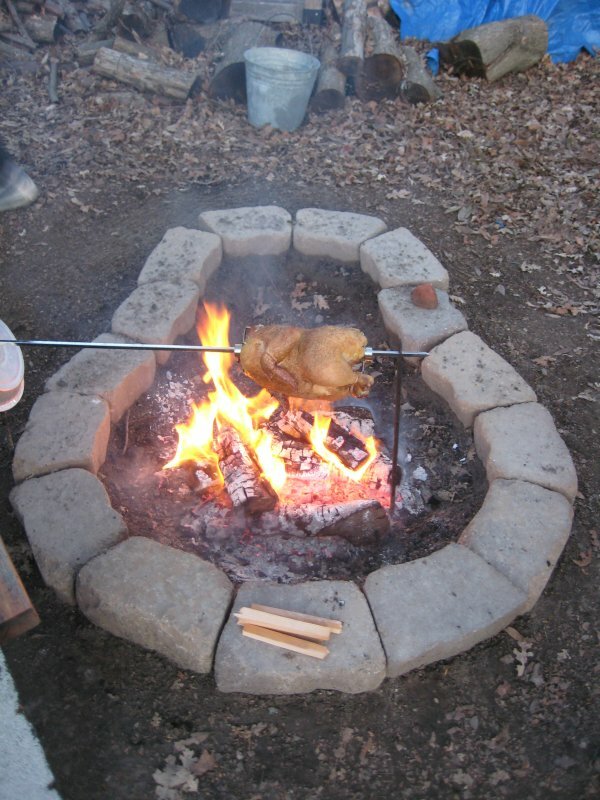 Outdoor Rotisseire Chicken: it's what's for dinner! Mr. Pirate is a man of many curiosities and abilities. Of late, he has been enamored of outdoor cooking fires. He built us a keyhole fire pit, around which we have had many enjoyable campfires, right in our own backyard. Tonight, he skewered a chicken (no! not one of *ours*!) and cooked it over a battery powered rotisserie. 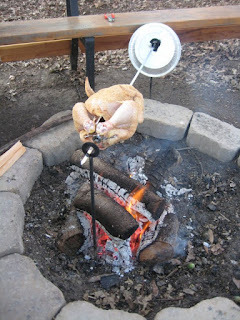 He's doing this not only for the novelty aspect but also for when we go camping this summer, doing a rotisserie dinner will be on our menu. This is the chicken when it first started out ... looking kinda pale and inedible. But look at it an hour later! Nicely browned and well on its way to be eaten. 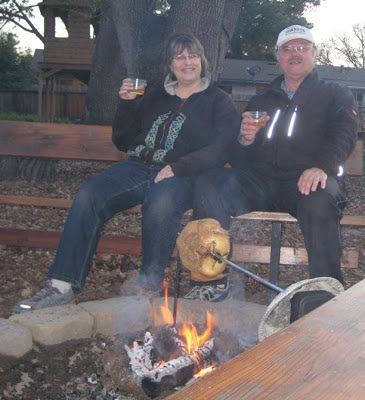 Here's what we were entertained by whilst sitting by the fire, enjoying each other's company and the ambiance. And, dang, if this isn't us! A toast! Skol! Hawaiian applique Forever Project: top finished! This pattern is "You Are In Our Hearts" from Pacific Rim Quilting Company. 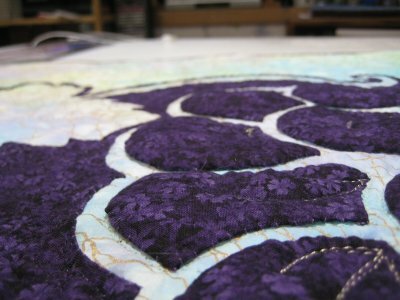 My notes tell me that I started this 42" square applique project on 1/9/2013. While I was at my annual quilting retreat in Phoenix, AZ this past weekend (2/10/13), I was able to finish it due to working on it at the airport, on the flight and at the retreat. The only drawback is that it *is* 42" square. This is a great size for a wall-hanging ... and in fact, this is what the pattern is designed to be ... but I don't particularly want another wall-hanging. I have lots of wall-hangings. I love them all. I like looking at them all. I don't want to take ANY of them down to look at a new one ... and I don't have any more wall space. So ... I was thinking of the possibility of adding on a top & bottom border. I have enough of the base fabric to do so. I have more of the batik fabric to so a linear Hawaiian applique border. But, I am woefully uneducated as to what an appropriate Hawaiian applique linear border should look like. 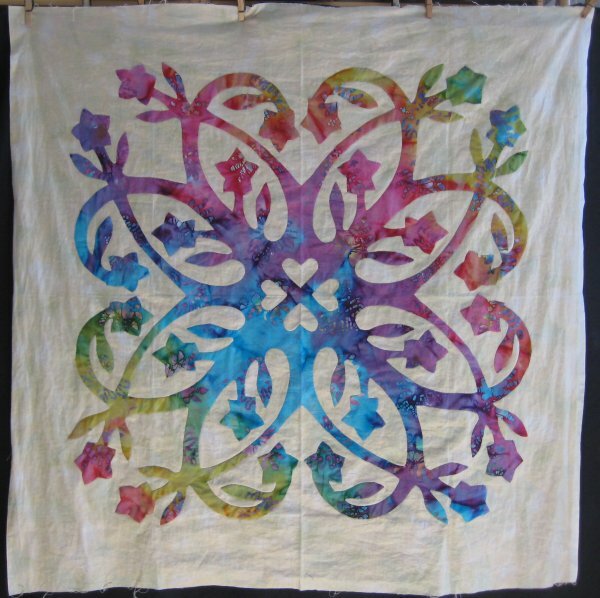 I've been doing some Google/Image searches and I've sent an email (with a picture) to Nancy Lee Chong (the designer & co-founder of Pacific Rim Quilting Company) for advice. This needle-turn wall-hanging is one of the 6 that I've completed. The pattern is from Nancy Lee Chong of Pacific Rim Quilting Company (this pattern is about half-way down the page). You don't need to do needle-turn, Nancy offers other applique methods as well. But back in June of 2012, I need a Forever Project™ and this was it. Since it was a Forever Project, I wasn't concerned about how long it would take me. Even then, I was finished a month later. Since this wall-hanging is for us, I wanted to do something different and not the same ol/same ol ... kinda like expanding my horizons. So, I did a faux-trapunto on the grapes. I've done this technique before and it turns out so nicely. The new-to-me was quilting a design in the negative space. What?? "That's not new! ", you say. And you'd be correct but .. it *is* new to me. I usually quilt a background filler in the background space. That's what background designs are for, right? Thinking of an overt design was the new part. 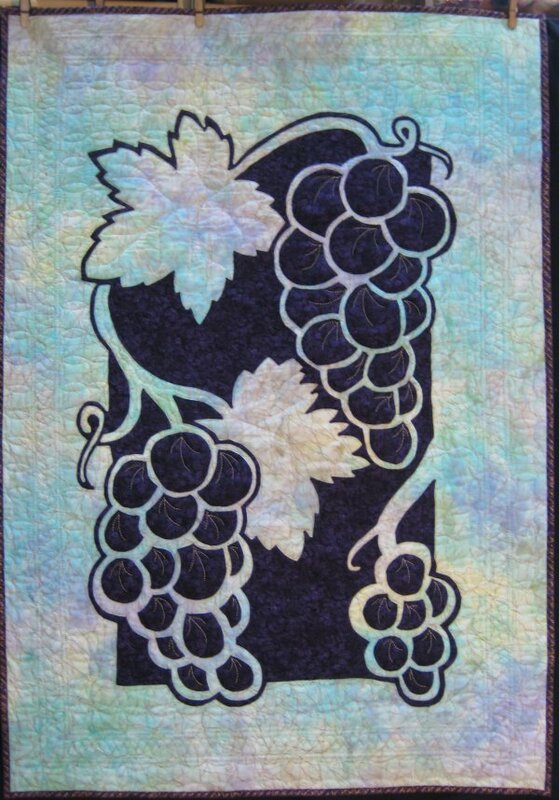 I chose to "frame" the applique in a triple frame: narrow/wide/narrow. On either side of the frame, I quilted Continuous Curves. 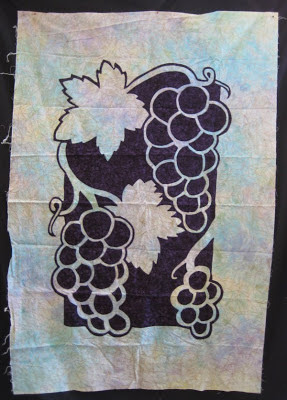 When I was marking the foundation grid prior to stitching the Continuous Curves, I discovered that I was less than accurate in my placement of the applique fabric on the background fabric. ::sigh:: I ended up with less space at the top than at the bottom. ::shrug:: I'll live with it. This project is also my February finish for the Lovely Year of Finishes. Those pictures are just teasers! 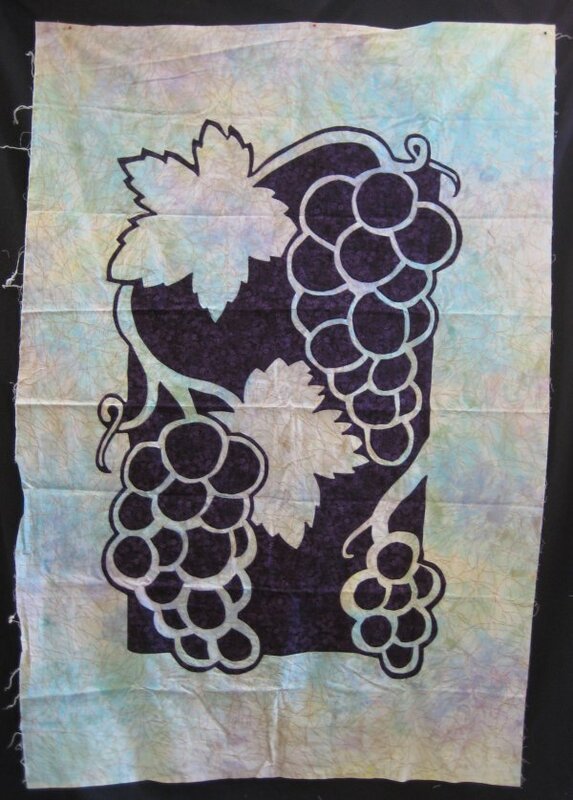 For all the gory details, links and more pictures, please visit my web page for the Grapes wall-hanging. Melissa of Sew BitterSweet Designs and Shana of Fiber of All Sorts started an interesting concept to encourage us quilters to get some of our long-standing UFOs completed. It occurred to me that this approach could be applicable to any crafter with a backlog of projects, but this one is specifically organized for quilters. When you've finished it, blog about it, link the finished UFO blog to the linky party .. voila, you're done for that month. As an incentive to finish, each month has gifts that were donated by the sponsors; they will be awarded on a random number basis. Sadly, I missed out on January; I hadn't read about the program. But here I am for February! I started this project in January 2012. I actually finished the needleturn part so the top is technically done. But, being the complete lamer that I am, I let the top languish in the UFO pile since then. Since this is my LYOF February project, I am now deciding on the quilting design to do. 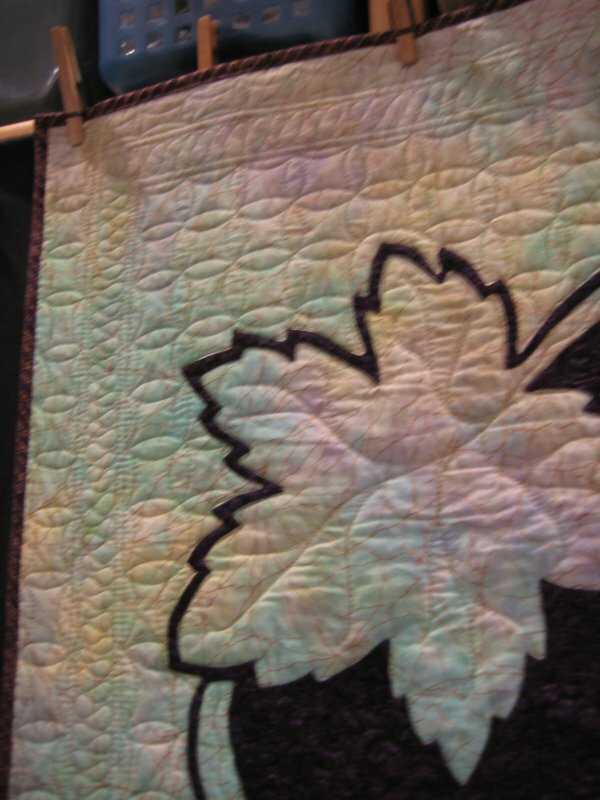 Nancy quilted her's in echo quilting, but that doesn't float my boat. Once the quilting has been decided on, it'll get loaded onto Lizzie and quilted.